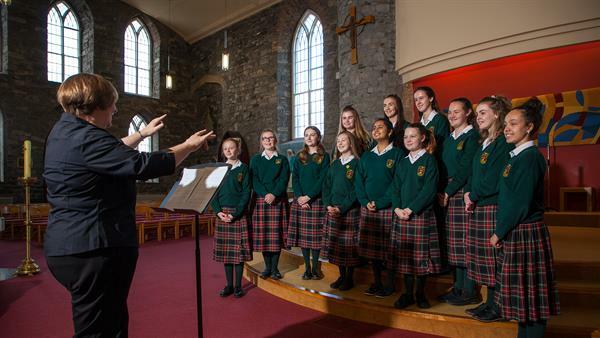 St Josephs’ College is a Catholic school community, founded by the Presentation Sisters and under the Trusteeship of CEIST – Catholic Education – An Irish School’s Trust. The student body reflects the pluralism of Irish society. Today we have students representing over 30 nationalities and various faiths. We embrace our pluralism in a positive way from within the Catholic tradition, welcoming the opportunity offered by cultural diversity to develop mutual respect. The liturgical and prayer life of our school is central, is expressed daily in numerous ways and is open and welcoming to all. Respect for religious diversity is understood as an expression of our core value of the essential dignity of each person – made in the image and likeness of Christ. Students and staff come together to pray in times of grief, exams, and transitions. The Presentation Day Mass, Taize Prayer Service, the Graduation Mass and Carol Service are key occasions in the life of the school. The lives of the saints are celebrated and our RE team ensures the altar is decorated appropriately. Retreat days are offered to all, to enable students to strengthen their relationships with the Lord. Despite a heavy workload within the local Parish, Father Tom Kennedy visits at times such as Ash Wednesday and during Lent to hear confession. The strong spirit of volunteerism and sense of care on the part of teachers, means that, we provide an informal chaplaincy service to meet the pastoral needs of our students. A spirit of inclusion, equality and welcome is the hallmark of St Joseph’s and relationships within the school community are characterised by this. We are clear, that St. Joseph’s College is not a “Grinds School.” While we promote academic excellence and deep respect for learning, we do not do so at the expense of holistic development or Christian formation. In St. Joseph’s we regularly remind ourselves that authentic education is about the kind of person your daughter is becoming – each student is on a Christian journey towards perfection and we encourage them to find inspiration for their lives in the words and example of Jesus. We go to great lengths to offer opportunities for humanizing education. Through a strong pastoral care system, positive relationships, meaningful assemblies and a wide range of co-curricular and extra-curricular activities, we nurture students essential humanity – their empathy, sensitivity, thoughtfulness, creativity . Our students love to spend time fundraising for charities, debating Justice issues, carrying out voluntary pastoral placements in the locality and providing peer support in school.